Your provider will give you a Custom Fit Kit and schedule a cap fitting session before your first treatment. It is important that the silicone cap is fitted very closely to your scalp as any air trapped between the scalp and the cap may negatively affect the cooling and results. The infusion center will provide the 2 caps needed for treatment. 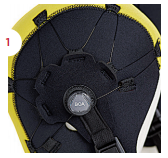 Make sure the correct size of silicone inner cap and the matching neoprene outer cap are at your infusion chair. Remove items in the kit from the sanitary plastic packaging. 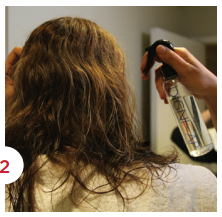 Fill the spray bottle with room temperature water and wet your hair thoroughly. You may wish to do this in the restroom with a mirror or with the help of a friend or caregiver and have a towel on your shoulders. 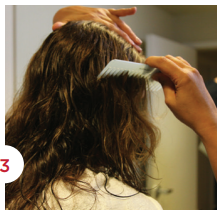 Saturate hair by sections and be sure the roots are wet. Hair and roots should be wet but not dripping. Using the comb, part hair in the center. Comb all hair straight down and as flat as possible. Use your hands to gently smooth hair down against your head. Do not tuck hair behind ears. 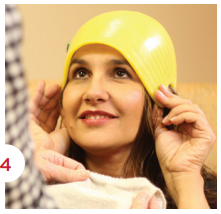 Place the colored silicone cap directly on your wet head. Cap should fit flat on top of head. 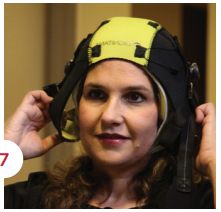 Use both hands and rock the cap side to side to ensure contact with crown of head. You may need assistance to ensure the cap goes on straight and stays in position. Position the knit cap over the silicone cap and pull down tightly. The cap ribbing goes at the back of the neck, velcro faces in. The knit cap should completely cover the silicone. Press down on top of head to further flatten the inner cap. Holding the knit ends, cross under the chin and secure to the opposite side. The velcro will adhere wherever it is placed. 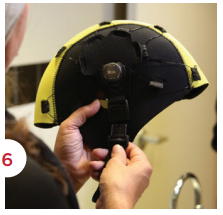 Holding the neoprene outer cap, attach one side of the chin strap into the buckle. 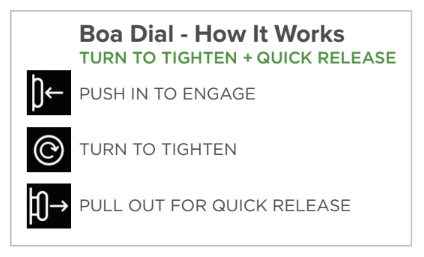 Make sure the Boa dial is in the open position (see illustration below). To put on the neoprene outer cap, make sure the logo is facing forward. Use both hands looping your fingers through the ear holes and pull down securely. Smooth the cap from the top, down the sides and back until you have close contact across all parts of your head. Attach the second end of the chin strap into the buckle. Pull on the strap ends to partially tighten. Push the Boa dials to the closed position and twist 1-2 times forward. Alternate between twisting the dials and pulling the chin strap until desired fit is achieved. Do not over-tighten. For a correct fit the cap should be snug but not tight. You’re now ready to begin your scalp cooling treatment. 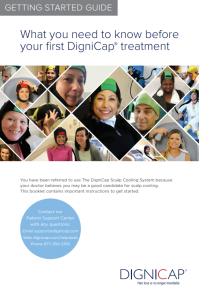 After completion of the post-infusion cooling time, the cooling cap remains on for another 5-10 minutes to allow the temperature to slowly increase back to room temperature and diminish discomfort. 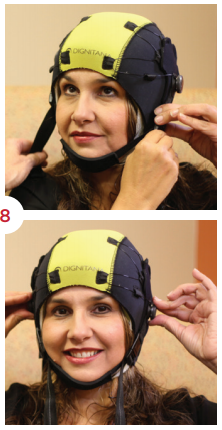 To remove the DigniTherm Click Cap, release one side of the chin strap. Pull out the Boa dial on each side. This will release tension in the cap and allow for easy removal. Wash the knit cap in a washing machine after each use to maintain shape.